WLDHS-0.1 Horizontal Ribbon Mixer is generally used in the mixing of viscous or adhesive powder materials, and the mixing of powder which needs to add liquid and pasty materials. Horizontal Ribbon Mixer is composed of a container, screw stirring paddles and transitional parts. The screw stirring paddles are generally made into double layers or three layers. 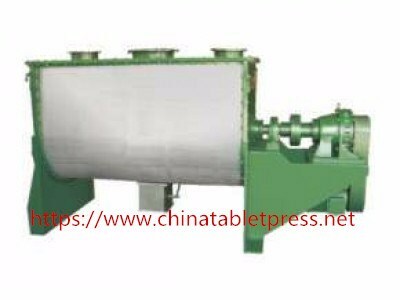 The outer paddle concentrates the materials from two sides to the center, and the inner paddle conveys the materials to the two sides from the center, which form the convective mixing. Horizontal Ribbon Mixer is generally used in the mixing of viscous or adhesive powder materials, and the mixing of powder which needs to add liquid and pasty materials. Meanwhile, because it is difficult to clean viscous materials, the machine is designed for mass production and applies to the mixing of materials that are not changed frequently. The loading coefficient is high and the occupied area is small. Horizontal Ribbon Mixer is generally used in the mixing of viscous or adhesive powder materials, and the mixing of powder which needs to add liquid and pasty materials.